Sorry, nerds, if you clicked the link hoping to read about an espresso machine you can program yourself with cheap DIY electronics, you’re out of luck. The ‘Arduino’ part is just the brand name here, and has no relation whatsoever to the infamous single-board microcontroller. But don’t let that dissuade you from reading on – this is quite possibly the most flossy coffee maker money can buy. I mean, just look at it. This thing looks like it fell out of the lunar lander during Apollo 16. The sharp, angular, stainless-steel exterior just screams “space-age,” but don’t be fooled – the futuristic design is more than just skin deep. A closer look at the Theresia’s guts shows that it’s got some NASA-level tech under the hood as well. First of all, the machine incorporates T3 technology from Nuova Simonelli – arguably the biggest coffee geek brand in the world. There’s a lot of fancy tech behind this, but when you get down to it, T3 is basically just a system that gives you extremely precise control over the delivery temperature of water, group, and steam – the three major variables that affect how your brew turns out. It’s also outfitted with an array of digital pressure and temperature sensors, all of which are in constant communication with each other through the system’s central control unit. This gives the machine the ability to actively monitor and manage each variable to make adjustments on the fly, resulting in a near-perfect pull every time with minimal effort on your part. 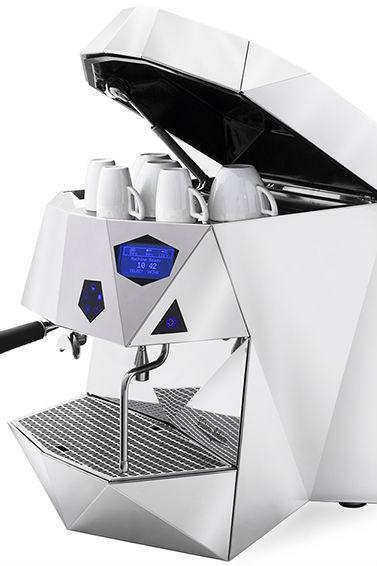 Despite being extremely high-tech, the Theresia was designed so that anybody – not just professional baristas – can use it. In addition to all the crazy space-age tech it’s got inside, the machine features a simple touchscreen control panel that makes programming and adjusting its settings a breeze. The only downside is that, since it was designed by renowned architects Doriana and Massimiliano Fuksas, the machine costs about as much as a used Ford Fiesta. The Theresia will put you back €5,000, which is roughly $6800 US. It might break the bank, but then again, how much do you spend on Starbucks each year? Find out more at VictoriaArduino.